Cross training is a fantastic way to get active, burn calories, and stay healthy, but sometimes the weather or your schedule gets in the way of your typical workout plan. Luckily, cross training at home is easy to do, and it doesn’t require any equipment! There are plenty of workouts you can do from the comfort and privacy of your own home right now with just a simple routine. Here’s a list of cross training workouts you can do at home. These are a combination of exercises for beginners and advanced trainers. Who needs a gym when you can do your own activities at home. Strength training is essential to overall health and productivity. Strength training workouts can use your body weight to help build muscle and make you stronger overall. Strength training is an important part of everyone’s training routine, and it will help boost endurance. It will also reduce your risk of injury. Many personal trainers encourage strength training for runners who tend to start slumping mid-way through their workouts, and for anyone else who tends to struggle with enduring any workout for the long-term. Do 30 reps of one, rest for a minute. Do 20 reps of the same, rest for a minute. Do 10 reps of the same, rest for 2 minutes. Repeat with each move you have chosen. This quick workout routine will help you build strength and endurance overtime. As you grow move advanced, you can add in a move or switch up the moves. You can also look at the order of the moves. For instance, when you’re first starting out you might try to alternate body areas as you go through the moves to make the workout a bit easier. But as you grow more advanced, you might do two or more moves in a row that focus on one area specifically to help you build muscle even more. Balance and flexibility are two essential aspects of any athlete’s training routine. Without one or the one, you’re going to be a wobbly/clumsy mess just waiting for an injury to happen. Balance will help you stay centered and hold good form while you workout and train, while flexibility will help you grow more advanced and avoid injuries. Yoga is the perfect way to work on both of these aspects, and it is the perfect replacement or pre-cursor to your normal workout stretch. Doing yoga once a day will also help you relax and center yourself. Repetitive motions like running will leave you feeling tight and sore in different parts of your body. Yoga will help you loosen up and relax, leaving you better recovered and better repaired for your next workout. It also helps athletes focus, and even if you’re not so serious about competing or even playing a sport, it can bring you a lot of focus and peace in your day-to-day schedule. There are many different types of yoga, but one of the most popular is Vinyasa, which will get your heart pumping while still staying low-key. For night time, there are other types of yoga you can do to help you relax and sleep better. 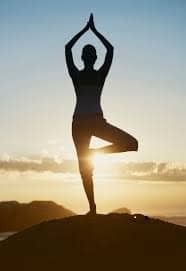 You can also find many free yoga workouts online aimed at many different things, from relaxation to flexibility to cardio. You can surely find a yoga workout to fit your needs and help you move forward in your practice. Whether or not you’re suffering from a sports injury, a low-impact activity can help you relax and aid your muscles in recovering from your workouts. Low-impact sports can also be an excellent way to open up your body while getting your heart rate pumping, without the fear of injury or joint pain. Swimming is one of the top low-impact activities and is especially popular amongst runners. You can simply swim laps in your local pool, or even brand out to your local lake for a slightly more difficult process. If you’re trying to keep your training confined to indoors, there are low-impact alternatives just as great as swimming. Yoga (mentioned above) is another favorite, along with general stretching and walking exercises. Walking and lightly jogging in place is low-impact can get your hard pumping just as much as an exhilarating outdoor run if done correctly. You can also follow the next suggestion for low-impact exercise, just work in some low-impact moves like squats, lunges, and mountain climbers and avoid jumping moves such as burpees. HIIT is still growing in popularity after it really took off a couple years ago, and the reasons are obvious. HIIT is an excellent way to get your strength training and cardio in at home. It’s high-intensity, meaning your heart will be pumping in no time, but it’s also interval based, so you’ll be using short spurts of energy to get your heart rate up and then taking a quick break for a few seconds. There are many different formats of HIIT you can follow, but just because it’s high-intensity doesn’t mean it has to be high-impact. You can work in mountain climbers (plank running) rather than burpees, and you can focus on squats to lunges rather than squat jumps. There are always modifications you can make to workouts to make them fit your comfort and activity level, and HIIT is no exception. If you want a quick way (most workouts are 20 to 30 minutes) to fit in your cardio and strength while building up a sweat, HIIT is the perfect at-home workout choice for you. Whether indoors or out, cycling remains a favorite exercise activity among all sorts of athletes. It’s quiet, it’s free, and it’s fun! It’s also low impact but it can be as intense as the ride desires. The pace can be adjusted to fit anyone’s needs and the rider gets to decide when they stop, when they go, and when they speed up. Cycling is a great way to get outdoors and experience the scenery while also getting in a great workout. Interval training can be applied to cycling with the use of an app or timer, all the rider has to do is pick a route (or setting on their stationary bike) that fits their plan and follow it accordingly. Uphill riding is also a fantastic way to build lower body muscles if that’s a goal of the rider. Cycling works the entire body, however, and is a source of both cardio and muscle toning. Just make sure you stop for a drink as needed. These five suggestions are just the tip of the iceberg. There are plenty of other activities you can do at home as part of your cross-training program. Using cross training workouts for weight loss has proved to be very successful providing you’re willing to put in the work. Most importantly you need to enjoy the workout routines you have set. If you’re willing to branch outside of your house and potentially to a swimming pool, laps or even just aqua jogging are also great workouts to add to your list of possibilities. Staying at home, you can also get a lot of work in—whether you’re focusing on stretching, cardio, muscle building, or all of the above. Doing a yoga warm-up followed by a HIIT routine would be one fantastic way to get your whole body workout in, but there’s a whole array of possibilities for you choose from. You can find many free workouts and programs online, or you can get creative and make your own using moves you’re already familiar with. Whatever your goal is, there are many ways you can reach it, and you can work on your goals from the comfort and privacy of your own home using any one of these suggestions. There’s no one to stop you and no reason not to start. Even if you have to do low-impact exercises, there are definitely ways to get your workout in each day without having to lug your gym bag out of the closet or even open up your front door. Since most of these things don’t even require equipment, there’s no excuse not to try them.